In the 1960s, Kate studied engineering at McGill University, and Anna painting at the Ecole des Beaux-Arts in Montreal. At the same time, they became stars on the city’s folk music scene, and soon began to compose their own songs. 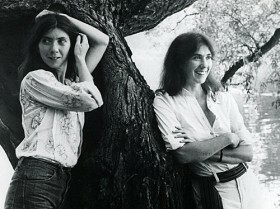 When some of these songs found their way into the repertoires of established artists, Kate and Anna were invited to record their own album, Kate and Anna McGarrigle, for Warner Bros. The elegance of their vocal harmonies, and the variety and originality of their music, delighted critics and fans alike, and the album earned international praise. Other albums followed, Dancer with Bruised Knees, Pronto Monto, an all-French record (called “delightful” by Rolling Stone), Love Over and Over (“triumphant,” said The New York Times), and Heartbeats Accelerating, where the Times said of Kate’s song “I Eat Dinner,” “Had Emily Dickinson been a late-20th century songwriter, this might be just the sort of piece she would have written.” The title track, Anna’s “Heartbeats Accelerating,” became a hit for Linda Ronstadt. Their 1996 album, entitled Matapedia, was released on the Hannibal/Rykodisc label. The Toronto Star called it “a quiet gem of an album” and The Globe and Mail said it was “arguably their best ever.” Kate and Anna followed up with The McGarrigle Hour, which featured family and friends including Loudon Wainwright, Linda Ronstadt, and Emmylou Harris, among others. The repertoire ranged from the rollicking sixties drug anthem “Green Green Rocky Road” to the high society complaint of Cole Porter’s “Allez-vous en.” Both of these CDs garnered glowing reviews internationally. 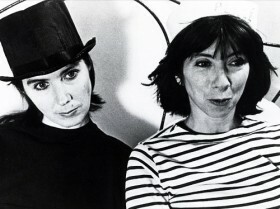 A year later, Kate and Anna videotaped a concert version of The McGarrigle Hour at the historic Monument National Theatre in Montreal; it was subsequently aired in Canada on the Global Network and in the U.S. on WGBH Boston. In December of 1999, The McGarrigle Hour was released on DVD by Hannibal/Ryko. Among their many collaborations, the McGarrigles have performed and recorded with the Irish group The Chieftains. In 1995, they recorded with Emmylou Harris on her Daniel Lanois-produced album Wrecking Ball (with Anna’s “Goin’ Back to Harlan” among the album’s tracks) and joined Joan Baez on her live recording Ring Them Bells. Closer to home, they joined Québec’s legendary chansonnier Gilles Vigneault on the cut “Charlie-Jos” on his latest CD, C’est ainsi que j’arrive à toi. Kate and Anna have composed and performed music for several movie and television productions, including a number by the National Film Board (NFB) of Canada. They were themselves the subject of an NFB film, directed by Academy Award nominee Caroline Leaf. They have been profiled by CBC and CTV television in Canada, appeared on Saturday Night Live and Late Night with David Letterman, sung in the Public Broadcasting System fundraiser Songs of the Civil War, and starred in their own PBS special, with Linda Ronstadt and Maria Muldaur as guests. In 1994, Kate and Anna were awarded the Order of Canada. The McGarrigles have appeared in concerts and festivals in all parts of Canada and the United States, in England, Ireland, Scotland, Denmark, Norway, Germany, the Netherlands, Belgium, and Switzerland, and in Australia, New Zealand, and Hong Kong. In the late 1990s/early 2000s, Kate and Anna were invited by producer Hal Willner to participate in a series of concerts celebrating the work of Harry Smith, the renown eccentric, filmmaker, and collector of American folk music. These concerts—in Los Angeles, London, and New York—assembled an eclectic variety of artists from the pop music world, such as Brian Ferry, Nick Cave, Van Dyke Parks, Jarvis Cocker, and Lou Reed. As a result of this collaboration, Kate and Anna sang background vocals on Nick Cave’s and Geoff Muldaur’s subsequent records. In 2005, Nonesuch Records released The McGarrigle Christmas Hour, a collection of traditional and contemporary holiday songs. The release is a celebration of family and friends; among the many contributors are Emmylou Harris, Anna’s daughter Lily Lanken, and Kate’s children, Martha and Rufus Wainwright. 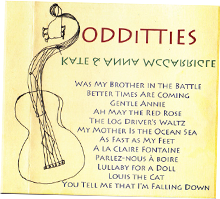 The fourteen tracks on the album comprise a wide variety of holiday songs—Emmylou Harris sings “O Little Town of Bethlehem” and Kate and Anna, with their daughters Martha and Lily, harmonize the traditional French song “Il Est Né.” More modern tracks include Rufus’s original “Spotlight On Christmas,” and his version of “What Are You Doing New Year’s Eve,” and Martha and Lily’s rendition of Jackson Brown’s “Rebel Jesus.” Kate and Anna, along with many of the album’s guest artists, will perform a special holiday concert at Carnegie Hall on December 21, 2005.